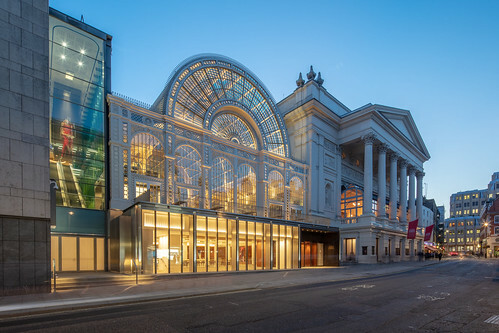 The Royal Opera was formed as the Covent Garden Opera Company in 1946, but behind it lies a tradition of operatic performance which goes back for more than 260 years at its home in Covent Garden. In each of the three theatres there have been on the site since 1732, opera has played an important role. The present theatre was built in 1858. During World War II it was used as a dance hall but after the war the idea of public subsidy of the arts was accepted and the decision was made to establish the Royal Opera House as the permanent year-round home of the opera and ballet companies now known as The Royal Opera and The Royal Ballet. It was the ballet company which reopened the building on 20 February 1946 with The Sleeping Beauty. The two Companies combined for Purcell’s The Fairy Queen that December, and on 14 January 1947, Covent Garden Opera Company gave its first complete opera performance, Bizet’s Carmen. The man appointed to run the new theatre was David Webster. His period as General Administrator coincided with the first three Music Directors of the opera company: Karl Rankl (1946–51), Rafael Kubelík (1955–8) and Georg Solti (1961–71). The Rankl period was principally one of establishing the Company and saw the beginnings of the careers of many British singers, including Charles Craig, Geraint Evans and Michael Langdon. This process continued throughout the 1950s and 1960s, with Covent Garden playing a large part in the development of performers such as Amy Shuard, Joan Sutherland, Josephine Veasey and Jon Vickers. Under Kubelík especially there was a considerable emphasis on the idea of an ensemble company, but internationally famous singers regularly appeared as guests: Kirsten Flagstad and Hans Hotter in Wagner; Maria Callas in a variety of roles, culminating in the legendary Franco Zeffirelli production of Tosca in 1964; Birgit Nilsson; Elisabeth Schwarzkopf; Boris Christoff; Tito Gobbi and Ramon Vinay. Guest conductors included Maria Giulini, Rudolf Kempe and Otto Klemperer. Among the producers and designers who worked at Covent Garden during this time, two Italians were especially notable – Zeffirelli and Luchino Visconti. As well as his Tosca, Zeffirelli also produced the 1959 Lucia di Lammermoor that took Joan Sutherland to international stardom. Later productions included distinguished stagings of Rigoletto, Falstaff and the double bill of Cavalleria rusticana and Pagliacci. Visconti’s work for the opera company was based on three great Verdi operas: the 1958 centenary production of Don Carlos and later stagings of Il trovatore and La traviata. He also mounted at Covent Garden an art nouveau Der Rosenkavalier. Much of this work carried over into the Solti era, but it was with his arrival as Music Director in 1961 that the Company took its place as one of the world’s leading opera companies. During his time, international awareness of Covent Garden and its singers grew considerably, a process confirmed by the success of the Company’s tour to Munich and West Berlin in 1970. The Solti period saw numerous developments in the Company’s repertoire and performing style. Of particular importance was the number of new productions of operas by Richard Strauss conducted by Solti himself, including Der Rosenkavalier, Die Frau ohne Schatten, Arabella and Salome. It was during this period in 1968 that the Company became The Royal Opera. Solti continued a fruitful association with The Royal Opera and in 1992 was created Music Director Laureate on the occasion of his 80th birthday. He conducted the very last operatic music to be heard in the theatre at a Farewell Gala marking its closure for redevelopment in July 1997. He died the following September. In 1970 Webster retired to be succeeded by John Tooley, and the following year Colin Davis took over as Music Director. This new partnership succeeded in maintaining the Company’s place in the top league of international houses. The world’s leading singers appeared regularly with guest conductors of the quality of Claudio Abbado, Christoph von Dohnányi, Bernard Haitink, Carlos Kleiber and Riccardo Muti. Major new productions included Götz Friedrich’s centenary Der Ring des Nibelungen and the first British staging of the complete Lulu of Alban Berg. During this period the Company expanded its work abroad with visits to La Scala, Milan, Japan and South Korea and to the 1984 Olympic Arts Festival in Los Angeles. At home, the Midland Bank Proms were launched at Covent Garden and later the Big Screen in the Piazza. In 1987 Bernard Haitink succeeded Colin Davis as Music Director, and in 1988 Jeremy Isaacs took over from John Tooley as General Director of the Royal Opera House until his retirement in 1997. Paul Findlay became Director of The Royal Opera in 1987, succeeded by Nicholas Payne in 1993. Over the 80s and 90s, The Royal Opera enlarged its reputation with an imaginative range of repertory and award-winning new productions. These included the British première of Berio’s Un re in ascolto, the first productions at Covent Garden of Borodin’s Prince Igor, Janáček’s The Cunning Little Vixen and Kát’a Kabanová, Rossini’s Guillaume Tell and Il viaggio à Reims, Mozart’s Mitridate, re di Ponto, Berlioz’s La Damnation de Faust and Prokofiev’s The Fiery Angel. The Company’s commitment to contemporary opera was seen in the world première in 1991 of Harrison Birtwistle’s opera Gawain, the recording of which won the Contemporary Category of the 1996 Gramophone Awards. The 1995/96 Season saw the world première of British composer Alexander Goehr’s opera Arianna as well as the British company premiere of Hindemith’s Mathis der Maler in November and a new production of Tippett’s The Midsummer Marriage to mark the composer’s 91st year. The following season, 1996/97, The Royal Opera celebrated its Golden Jubilee with performances of Pfitzner’s Palestrina in London and New York. The renewal of Wagner stagings, begun in 1993 with Die Meistersinger von Nürnberg, continued with Der Ring des Nibelungen which was completed in autumn 1995. Three full cycles were given in Autumn 1996, all conducted by Haitink. Haitink received a Laurence Oliver Award for conducting Siegfried and Götterdämmerung in 1995 and, together with the Orchestra of the Royal Opera House, received the Evening Standard’s award for Outstanding Artistic Achievement in Opera, ‘for the consistently high quality of their music making throughout 1995’. Another distinctive feature of Haitink’s time as Music Director was his fostering of the Orchestra’s appearances on the concert platform both at Covent Garden and in major London concert halls, as well as encouraging the formation of the Orchestra’s own chamber ensemble. The roster of distinguished guest conductors was also maintained across the generations, including Claudio Abbado, Colin Davis, Christoph von Dohnányí, John Eliot Gardiner, Daniele Gatti, Valéry Gergiev, Carlos Kleiber, Charles Mackerras, Simon Rattle, Gennadi Rozhdestvensky, Esa-Pekka Salonen, Georg Solti and Christian Thielemann. Edward Downes, a renowned Verdi scholar and practitioner associated with The Royal Opera since 1952, conducted the first performances at Covent Garden of Attila (1990) and Stiffelio (1993). He was the mastermind behind The Royal Opera’s seven-year Verdi Festival 1995–2001, during which it was planned to perform all 28 of Verdi’s operas. During the closure period he conducted a new production of I masnadieri in Baden-Baden, Savonlinna and Edinburgh, before returning to London in June 1999 (Sadle’rs Wells Theatre). On 14 July 1997 a Farewell Gala given by both The Royal Opera and The Royal Ballet marked the closure of the Royal Opera House for a major two-and-a-half-year redevelopment. During the first season of the closure period, 1997–8, The Royal Opera presented seven new productions, three at the Barbican Theatre, and four at the Shaftesbury Theatre. In this season alone, The Royal Opera received the following awards: for Paul Bunyan, the Evening Standard Award for Outstanding Artistic Achievement and the Laurence Oliver Award for Best New Opera Production; for The Turn of the Screw, the Evening Standard Award for Outstanding Production and the South Bank Show Award; and The Royal Philharmonic Society Award for The Pilgrim’s Progress. During its second year away from Covent Garden, The Royal Opera performed new productions of The Bartered Bride and The Golden Cockerel and revived the award-winning Paul Bunyan at the newly redeveloped Sadler’s Wells theatre. In 1998 Richard Jarman was appointed Artistic Director of the Royal Opera House during the redevelopment of the Royal Opera House. He was succeeded by Elaine Padmore, who joined the company as Director in January 2000. In December 1999 the Royal Opera House reopened with a colourful production of Falstaff, directed by Graham Vick and designed by Paul Brown. The production celebrated the extraordinary range of new technical machinery available to production teams working at Covent Garden. The first two seasons were a period for settling into the new building and the company presented a range of fine revivals, as well as some splendid new productions, including Martinů’s The Greek Passion, directed by David Pountney and co-produced with the Bregenz Festival. Patrice Caurier and Moshe Leiser directed a highly acclaimed new production of Rossini’s La Cenerentola, popular with critics and audiences, and Nikolaus Lehnhoff’s superlative production of Henze’s Boulevard Solitude swept the board at both the Laurence Olivier and the South Bank Awards. A new Parsifal and Trovatore graced the stage, as did Francesca Zambello’s new Queen of Spades production and a brooding double-bill of Bluebeard’s Castle and Erwartung from Willy Decker. La rondine and La sonnambula were staged, and David McVicar made his debut production for the house to open the 2001/02 Season – a new Rigoletto, conducted by Edward Downes. A Young Artists Programme was established in 2001, creating a rich resource for the development of new talent. Antonio Pappano became the Music Director of the Royal Opera in August 2002, opening his first season with Ariadne auf Naxos, directed by Christof Loy, and also including a new production of Berg’s Wozzeck, directed by Keith Warner and designed by Stefanos Lazaridis, who subsequently became the creative team with Pappano for the new Ring introduced 2004–06, culminating in Ring cycles at the start of the 2007/08 Season. Another highlight of his first Season was the world premiere of Nicholas Maw’s Sophie’s Choice, which was conducted by Sir Simon Rattle and directed by Sir Trevor Nunn. Another Royal Opera commission, the highly successful world premiere of The Tempest by Thomas Adès, took place in 2004, conducted by the composer, and in the 2007/08 Season, the latest Harrison Birtwistle commission was produced, with John Tomlinson in the title role of The Minotaur, conducted by Pappano. Other highlights in Pappano’s first decade with The Royal Opera included Shostakovich’s Lady Macbeth of Mtsensk, directed by Richard Jones, Peter Grimes, directed by Willy Decker, Carmen, directed by Francesca Zambello, Don Carlo, directed by Nicholas Hytner, and Tosca, directed by Jonathan Kent, replacing the Royal Opera’s long-lived Zeffirelli production from 1964, which had starred many famous guest artists of the company, starting with Maria Callas and Tito Gobbi. Another Zeffirelli production, Pagliacci, starring Plácido Domingo, was conducted by Pappano in the 2002/03 Season. Domingo was also the star of Alfano’s Cyrano de Bergerac in 2006, and took part in the 2007 Ring cycles. The extensive number of operas conducted by Antonio Pappano since his appointment have included Aida, Un ballo in maschera, Don Giovanni, Falstaff, La fanciulla del West, Fidelio, La forza del destino, L’Heure espagnole, Gianni Schicchi, La Gioconda, Madama Butterfly, Le nozze di Figaro, Otello, Werther, Les Troyens, Manon Lescaut, Anna Nicole, I due Foscari, Tristan und Isolde and Andrea Chénier. The Royal Opera continues to invite the world’s greatest artists to perform at Covent Garden. Such artists as Thomas Allen, Joseph Calleja, Sarah Connolly, Plácido Domingo, Gerald Finley, Juan Diego Flórez, Vittorio Grigolo, Jonas Kaufmann, Anna Netrebko, Bryn Terfel and Sonya Yoncheva are among the many frequent guests. In recent years, The Royal Opera has given an average of 150 performances per season, September–July, of approximately twenty operas, nearly half of these being new productions. Since 2012 the Company has also curated the Studio Programme in the Linbury Studio Programme, presenting chamber operas and a range of experimental new commissions from up-and-coming and established composers, including Harrison Birtwistle, Luca Francesconi, Philip Glass and Salvatore Sciarrino. The Royal Opera continues to widen its audience through a range of innovative means: through cinema broadcasts, through television and radio broadcasts, through free YouTube broadcasts and through the BP Big Screens, which are broadcast for free to open spaces around the UK.